We were very pleased with our stay at 308 Tidewater. The third floor condo was high enough to see over the dunes and palms trees, but not scary high. The location on the east side of Orange Beach was good with restaurants and shopping nearby. The unit was very clean and nicely furnished with a beach vibe. Both bedrooms wand the living room had ceiling fans and very nice wall mounted flat screen TVs. The kitchen had everything we needed and the appliances all worked beautifully. The bathrooms were spotless and the big tub in the master was luxurious. As tall people We appreciated the shower heads placed high enough for us. I also felt safe in the building. Both the parking lot and the condo had touch pads for entry (nice to not have to mess with a key). There was a security person on duty and the unit was equipped with smoke detectors and a sprinkler system. The kitchen cabinets and counter were not deluxe, but functional. The managers, Alabama Getaway, were easy to work with. Over all in a nice affordable place to stay I would stay here again. Nothing, and I mean NOTHING IS BETTER than falling asleep in the master while listening to the sounds of the surf!!!!! Absolutely beautiful-tranquil! Just what we needed after a busy work week! We came here to run the Big Beach Half marathon. Perfect location on the course! So nice and cozy. Love it ! Everything was amazing. The condo was spacious and had amazing views. Everything you needed and more was provided. Great for families or couples just wanting a weekend away. 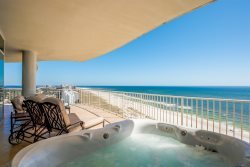 This was our first trip to Orange Beach, and this condo was a perfect place. It was beautifully decorated, spacious, extremely clean, inviting and comfortable. The kitchen was fully equipped. The location was great. We had spectacular ocean views. The sad part is it is already booked for next year. Beautiful condo! Quality everywhere! Everything you could need for a wonderful holiday. Well maintained home close to the gulf, views from the porches. Updated! Would recommend! My husband and I rented the condo for a week the end of January. The weather was not that great so we spent a lot of time in the condo. The condo is exactly as described and shown in the photos. The condo was very clean and the the living room furniture was comfortable. The master bed is a nice comfy king with a great view looking out at the ocean. We would definitely rent this condo again. We had a wonderful winter retreat from Chicago. Even in Jan weather at the Gulf was perfect and we were able to enjoy sitting on the patio watching sunrise and sunsets. We really enjoyed the condo. Close to the water and the beach and beautiful condo. Perfect few days. We all loved the property and the location. We had 5 adults and could have easily slept more. Clean and comfortable. Great views from every room. We would definitely recommend it and plan on returning. Plenty of things to keep you busy nearby or just relax on the deck listening to the ocean. Very nice outdoor hot tub and pool area plus indoor heated pool and hot tub, sauna and steam room. The property was exactly as pictured. We were very pleased. Great communication before and during our stay. Wonderful location. The unit was simple, but thought out with its decorations. The showers could use a renovation, but the ice maker was a bonus. The properties amenities were amazing, i.e. the pool, sauna, gym and quick beach access. The condo was clean and had everything I needed for my month-long stay. The master bedroom was very comfortable and I loved the large balcony. My daughter and I shared some meals out there and I loved sitting out there in the mornings with my coffee. As noted in a previous review, the cold and hot water lines were reversed on the washer, but they sent someone over the same day to fix that. Alabama Getaways was very quick to respond to any questions or problems I had. Thanks for a great stay! Very nice, as described. Everything was in good condition and clean. Highly recommend. This is the best condo I've stayed in. It is beautiful and comfortable. It is fully furnished with everything you need. We had a wonderful time. Thanks for sharing this condo with us. This is a terrific condo!! It is very spacious with wall to ceiling windows in living area. It is a corner unit which adds to the beautiful view of the beach. This condo was a beautiful place for our quick weekend getaway. We were very impressed with this property. It was very spacious and fit our needs. Three bedrooms and three baths were very convenient for entertaining. We enjoyed the use of the indoor pools at this facility. The kitchen was supplied with all the necessary cooking utensils need to prepare meals. We enjoyed this facility greatly. We stayed with a group of friends on a weekend getaway and absolutely loved it! The condo was roomy and comfortable. The Decor is beautiful and the views amazing! We especially enjoyed the comfortable beds and the shower in the master bedroom was awesome! Although it was off season and the temperatures were cooler we enjoyed walking on the Bech with easy access and also enjoyed the indoor pool and hot tub. Location was good with easy access to restaurants and bars with a quick Uber ride. Check in and check out was smooth and easy. We really enjoyed our stay and hope to be able to return soon. The condo was very nice and the view was great from the balcony. We had plenty of room to relax and it had everything we needed to enjoy our stay in Gulf Shores. The only trouble we had were operating the TV remotes! I am sure someone will have to reset the remotes for the TV/s.Thank you for your hospitality! It was a great condo! Comfy beds and very spacious. It was well stocked with necessities. Netflix option was a nice bonus! The main reason I cannot give it 5 stars is because the 2 guest rooms near front door need blackout shades/curtains. The light from the hall outside front door lit up the room and it kept us awake. We were very happy with the property and the location except for the location of the hot tub and pool. We didnt like that you had to walk across the parking lot to get to it and the pool was small. We also couldnt get to the gym. The door to the stairwell was locked and the elevator didnt work. The view from the sliding glass doors were wonderful. Large balcony with 2 tables. Would highly recommend this condo to family and friends. Hope to come back again and stay longer. Beautiful property. Everyone very friendly and helpful. We loved it and hope to come back soon!